Babies have been cradled inside a sling, next to their mother's breast. Babies feel mother's constant warmth and protection, next to her heart. The most natural way to carry your little one is snuggled close to your heart, in a cotton baby sling. 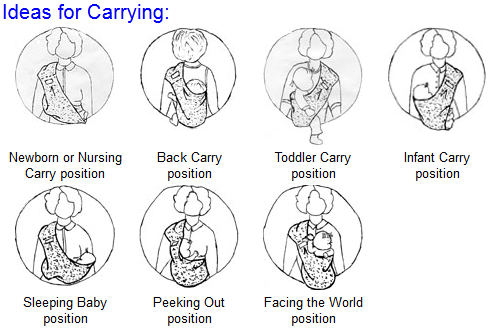 Carry your baby in a large variety of positions, it is so simple to use. 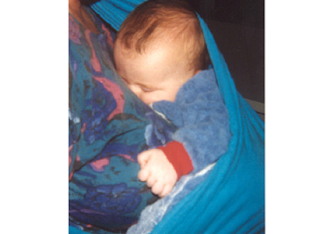 Unique fold creates a hammock effect to cradle newborn, nursing infant or sleeping child. Baby can lie down and sleep, or nurse in privacy with head and neck support. This is a very simple, yet economical, sling carrier. No buckles, straps, extra padding or adjustments to make. The strap doesn't dig in, cushions entire shoulder for comfort. Weight distributed on your shoulder, hip and across your back helps to reduce back fatigue and lessen sway back. You'll need 45" wide fabric, with finished edges. Cut about 56" long for short, 60" for medium and 64" for tall parents. Place cut ends, right side together, and stitch at least 1" from the raw edge. Turn fabric over, and top-stitch on right-side 2 or 3 rows through all layers, for strength. Fold sling in half length-wise once, and then again. You should end up with a sling roughly 10" x 26" (28")(30"). One long side will have a single fold, the other will have one fold and two finished edges. About one inch down from the seam, sew a 1" x 3" rectangle to hold the folds in place. To use: Place sling over one shoulder and on opposite hip. Baby can ride on your hip inside two layers of the sling, or you can open up the seat part to cover the baby completely. If your sling is too loose at your baby's back, tighten fabric to hold the baby upright and use a diaper pin to mark. Remove sling and sew up a dart at the place marked with a diaper pin.